Greetings, listeners! It’s been a long time (we shouldn’t have left you), so I’m delighted to return with a seasonal playlist, for your listening pleasure. With the autumn equinox occurring on 22 September, we’re officially into the season of falling leaves, cooler weather and shorter days. Despite the passing years, I always associate this time of year with starting school and the mixed feelings of excitement and dread that this often entailed. In the southeast, we’ve been fortunate enough to have a fair amount of sun this summer, so I’m about ready to get the woolly jumpers and scarves out and get cosy indoors. It’s also a time to recover and take stock after the busy summer months. For this reason, autumn’s playlist is relatively restrained, gently easing you into the months ahead. Autumn’s soundtrack includes a track from the self-titled debut album of supergroup case/lang/veirs. The combined talents of these three talented artists (Neko Case, k.d. lang and Laura Veirs) are not to be dismissed lightly and the album delivers with aplomb. Lang’s soothing tones, warmth and flawless pitch remain as sublime as ever and the three artists compliment each other beautifully. Read about the challenges and rewards the project presented here. Falling into the category of Americana, this album should ideally be listened to whilst sitting on a porch in a remote cabin, in North America, with a setting sun and a whisky in your hand. And, I don’t even like whisky. Recommended. Despite selecting 312 tunes (and counting) for The F-Word’s playlist feature, I’m still staggered at the artists I’ve previously neglected. No ABBA, Donna Summer or Roxette?! Heresy! Released in 2008, Santigold’s debut album, Santogold (Santigold eventually changed the ‘o’ in her name to an ‘i’), is one of my favourite albums, with every track an absolute banger. If you’ve never heard it before, it’s well worth checking out. Why I’ve never included any of her tracks before in earlier playlists remains a mystery. Although I love some of more high-energy tracks, such as ‘Say Aha’, ‘Unstoppable’, the Switch and Sinden remix of ‘You’ll Find a Way’ – damn, all of the tracks are killer! – ‘Anne’ is a more subtle and mature track. I hope you like it as much as I do. Dolly Parton’s ‘Jolene’ is also a glaring omission from previous playlists. How?! Other classic tracks for autumn include Fleetwood Mac’s ‘Gold Dust Woman’ and Mike Oldfield’s ‘Moonlight Shadow’, sung by Maggie Reilly. St Vincent’s ‘Prince Johnny’ is absolute perfection. When this was first released, I wasn’t wild about it, but the more I listen to it, the more I appreciate Annie Clarke’s artistry. What a woman. As for Alex Party’s ‘Don’t Give Me Your Life’… it’s all about the LOLs and I challenge you not to sing along, whilst also attempting poorly executed vogue hands. Click here for your autumn playlist. Enjoy! 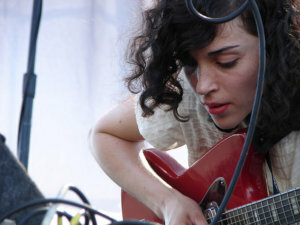 The image is close-up shot of Annie Clark of St Vincent. She appears to be onstage and holds a red guitar. Cables are around her and she looks deep in concentration. Picture by Joshua Smelser, shared under a Creative Commons licence.